Leviton Integrated Networks is designed to meet growing consumer awareness and demand for a total home system. It is a product that will enhance the image of your homes, and allow you to offer upgrades with high perceived value and modest impact against total home pricing. Most important, Leviton Integrated Networks is a compelling traffic builder and sales closer against competitors who do not offer this powerful lifestyle amenity. The almost universal presence of the Internet, the rise in the popularity of home offices and theaters, the desire for multiroom audio, and an increase in popularity of dimming, security lighting and surge protection makes Leviton Integrated Networks an essential part of your total home presentation. The structured media system that appeals to people. Not just techies. The Leviton Integrated Networks structured media system provides a flexible, easily expanded capability that makes living the “wired” lifestyle simply living, instead of an endless exercise in mastering technology. 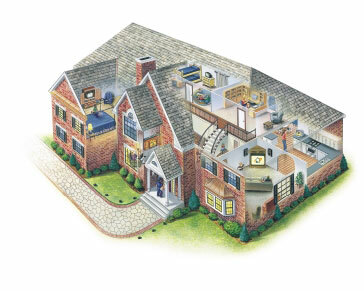 Leviton Integrated Networks has a system for all types of houses, from starter home to trade-up to custom. Leviton Integrated Networks connects with integrated voice and data utility services, to provide multiple phone lines, cable modem, fax/modem capability for home office, whole-house internet access, and in-home networking for computers and shared peripherals, like printers. 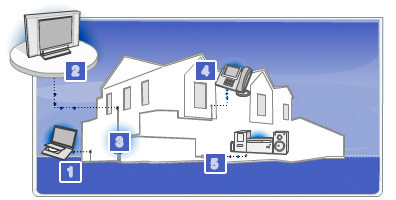 Leviton Integrated Networks entertains with whole-house stereo and video (VCR, cable, satellite, DVD, DTV). It also sets a mood with dimmers that coordinate with room decor while they adjust lighting levels to make watching television that much more enjoyable. Leviton Integrated Networks protects by bringing closed-circuit video monitoring to children’s rooms, and providing home control for programmed security lighting. Whether you use it as an upgrade or a standard feature, Leviton Integrated Networks adds value to your homes and makes them easier to sell. A system ready for home networking, video, stereo and security. The heart of the Leviton Integrated Networks system is the Structured Media Center, a unit that uses snap-in modules to allow easy installation, customization and future-proofing. The Structured Media Center is linked to QuickPort multimedia outlets that provide room connections for voice, data, video and stereo. Whole-house surge protection is also available to protect the home and its many sensitive electronic contents from damaging overvoltages. Leviton Integrated Networks also offers more-visible advantages. Because it’s from Leviton, the popular Decora style is designed as much for fit and finish and overall aesthetics as it is for electrical/electronic performance. After all, the aim of Leviton Integrated Networks is to function with the utmost reliability, without calling attention to itself. Leviton Integrated Networks: Backed by Leviton marketing and training support. We are dedicated to providing powerful corporate support for the Leviton Integrated Networks home system in a model home program that provides merchandising displays, marketing graphics, builder sales training, consumer sales tools, web site, and a one-year limited warranty. A unique combination of forward thinking technology and old-fashioned reliability from the company that may already be meeting your line voltage needs, Leviton Integrated Networks is a total solution to the wiring requirements of you and your buyers. It will reduce the number of vendors you have to deal with by establishing a single source for much more of your electrical and electronic requirements. The Leviton Integrated Networks Base Package gives you everything you need to enjoy today’s electronics in your new residence. These wiring components distribute multi-line phone/fax/internet (DSL compatible†) and TV signals throughout your home. Your system can be easily upgraded for home networking and enhanced home entertainment needs in the future. The Home Entertainment Package offers everything you need for full access to today’s home entertainment and information age electronics. This package combines multi-line phone/fax/internet service (standard speed and high speed DSL, cable modem and ISDN) and distribution of video signals throughout the home, including cable TV, digital cable, antenna, satellite TV, VCR, DVD, security camera/CCTV and more. The Structured Media Center distribution enclosure can be easily upgraded with other voice/data and audio/video modules as your networking, home entertainment and home office technology needs change.